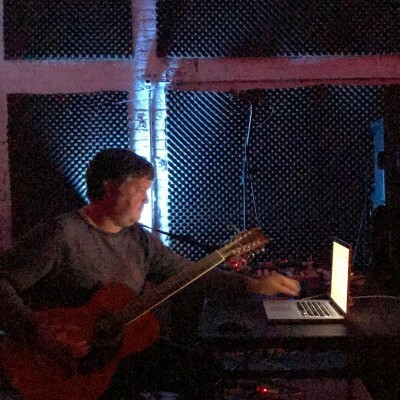 As a Sonic/Visual Artist and extended guitar musician, my work focuses on psycho-acoustics, audio phenomena and the intimacy of the listener's experience. My process is entirely improvisatory in nature and requires me to record in real time. Using a 12-string acoustic guitar and a range of processing techniques, such as negative frequency responses, formant synthesis and multi-channel surround sound, I construct feedback systems that resonate the guitar’s strings, ringing out sympathetic tones. On the surface, my compositions have many elements of musicality, with harmonic color and multilayered arrangements, but it’s beneath the surface where my interests lie. My fascination is with the boundaries of perception, the permeability of the body and the space between what exists and what is felt. It’s here where I start to build and shape the unseen and unheard, magnifying these concealed murmurations and indeterminable intrusions that exist below the scope of our hearing, but have real resonant affect upon the body. So as to invite a physical and emotive experience of sound as swarms, swells and cavitating shifts that perforate the acoustic field and engulf the listener. I try to produce aural equivalents to seismic violence, akin to the calving of an ice shelf or the unnatural silence before a storm. Ann Hamilton, Rafael Toral, Ogurusu Norihide, Kenneth Kirschner, Mountains, Koutaro Fukui, Richard Devine, EVOL, Dave Gross and Liz Tonne, Joe McPhee, Andrew Deutsch, and Pauline Oliveros. and collectively with Dan Walsh (Shy Layers), and Jason Forrest aka Donna Summer under the name "the Computers". 2015 One Day: Le Petite Camargue – by Vera Lutter, Gagosian Gallery, NY. Recorded and engineered by Ian Epps. 2012 One Day: Carré d'Art – by Vera Lutter, Musée d'art contemporain, Nîmes, France. Field recordings of nightingales in Le Petite Camargue, Alsace, France. 2008 Musical, by Dara Friedman (Gavin Brown’s Enterprise, NY), commissioned by Public Art Fund. 2014 Media Arts Assistance Fund Grant, the New York State Council on the Arts & Wave Farm.